A few months after she joined Jawaharlal Nehru University (JNU), Delhi, Ayesha Rachel became an addict. She just couldn’t get enough of her BlackBerry Curve. “I was a Nokia user but this thing is addictive, and no other phone gives me this value for my buck,” she says while sending messages on the BlackBerry Messenger (BBM). This is a paradox. BlackBerry is a phone for the staid corporate types. So why is a kid filled with idealism, revolution and “har ek friend zaroori hota hai” thoughts, using a square phone such as the BlackBerry? Well, that’s the story. Research in Motion (RIM), the company that owns BlackBerry, has managed to achieve two things in the last 18 months. It has managed to grab a big chunk of the smartphone market in India. In 2010, its market share stood at 6 percent of the smartphone market in the first quarter. By the end of 2010, they had over 10 percent of the market. By May this year, it was at 13 percent. By the end of 2011, they are expected to have around 20 percent, which would be close to the market share of Samsung, the current smartphone market leader in India. 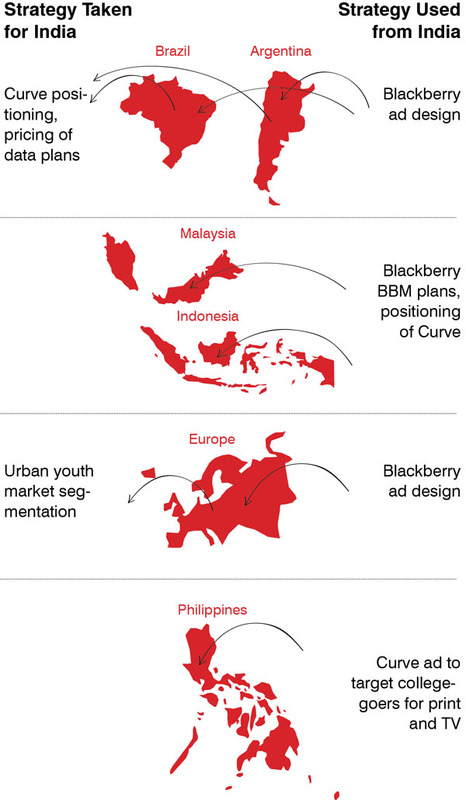 And BlackBerry has done this by attracting that trendy, but hard to please segment: The young consumer. Frenny Bawa, the 51-year-old managing director of RIM, who has overseen the execution of the company’s plan in India, has done it when RIM’s situation globally has been distinctly downbeat. Over the last six months, RIM’s stock price has lost two-thirds of its value. Analysts in the US think that Apple will wrest the enterprise market from RIM. Certain investors such as Jaguar Financial Corporation have said RIM should spin off its patents to boost investor returns. Such reactions may be extreme, but it highlights the soup that RIM is in globally. In light of this, what Bawa and her team have achieved in India is creditable. And while it may not solve RIM’s global problems, the success in emerging markets like India will surely buy it time to become competitive again. For that to happen, Bawa will have to make sure that RIM continues to see success in India. Can Bawa do that? The answer lies in understanding why RIM has succeeded in India. The success of product companies usually stems from one product that captures the people’s imagination. Think of Sony and Playstation, Samsung and Galaxy. Then there is Apple with not one, but three such products: iPod, iPhone and iPad. For RIM India, that product is Curve. Around 15 months ago, when BlackBerry was clearly outside the top five, the RIM team in India was asked to find the reasons for being slow to grow in a market where explosive growth has become a norm. In Mumbai, the senior members got together to discuss the results of a survey that was commissioned to see whether RIM could grow faster. As the survey was tabled, it was clear to all sitting there that something needed to change. “We were facing a challenge here — how do we shift the perception of being a phone for push mail users to a brand which stood for fun, and not just for the corporate guys,” says Sunil Lalvani, RIM enterprise sales director (India). Lalvani had a quandary before him. To appeal to the young, they had to be cool. 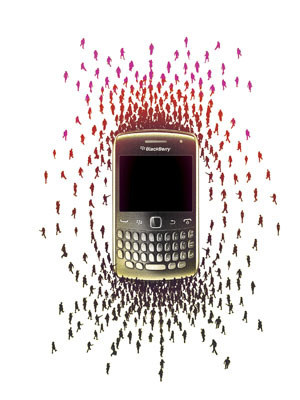 BlackBerry’s core customers in India were mostly corporate employees – how to retain them, and yet change your image? How to be available everywhere and still be aspirational? Bawa and her team adapted the BlackBerry approach in other emerging markets. Harish Bijoor, brand expert and founder, Harish Bijoor Consults Inc, explains why RIM has succeeded. “Their mix of plans and pricing seems to be working quite well and has retained the aspirational value. Young people are able to stay connected 24x7, at an affordable price with a brand that they can show off,” he says. For the first time, BlackBerry made a device, the Curve 8520 specifically for the Indian market. A model similar to the sub-10,000 Curve was earlier priced around Rs. 14,000. Bundled with the phone was the access to BBM. For Nupur Raval, an MA student at JNU, this was a winning combination. “If I were to take an iPhone, it woudn’t suit my budget. With the Curve, I can chat on the BBM, send files to anyone across the globe and it is all free. Its plans are within my budget,” says Raval. Now in India, 90 percent of mobile connections in India are prepaid. BlackBerry sat down with operators, and renegotiated new, cheaper plans for its BBM and e-mails. “It was for the rich kids earlier, now it’s almost a lifeline of communication across all levels,” says Anirudh Dube, 31, who runs a company, Ducom, in Bangalore. The game-changer, of course, was BBM. For the young consumer, it is more about remaining connected 24x7 than phone calls. For RIM, teenage to college-going women is a market they have tapped, and which holds great potential. Which is why expect to see more of candy-coloured variants in the Curve range, which have been a hit. “I would go for them any day, rather than phones in only black and white which have been around for ages,” says Anjali Grover, a student of Amity University. Good Internet connectivity is a plus too. “The Internet connection is better than any other device,” says Balaji Shankar, 24, who works with Wipro in Bangalore. He gave up his Samsung for a Blackberry. Now the challenge for RIM is to extend its success. For that, it’s now hitting larger number of cities. Presence in more cities with new models, like the ones launched a month ago, will be pivotal in expanding market share. “We will be in 6,000 outlets with majority of them in Tier-II and Tier-III cities by the end of this year. We are also planning to expand the product portfolio in 25 new cities this year,” says Sanjay Kaul, senior director, channel and sales. Currently, it is present in 80 cities through 3,500 outlets. RIM has launched seven new devices along the price band that starts at Curve and goes on till Bold 4, which retails at Rs. 32,000. RIM is targeting not just the individual retail customer, but also the millions of small businesses who will get e-mail and BBM bundled in a single package. “This is the most secure connection I can have. While there are lots of phones which cost the same as the Curve, there is only one with BBM and secure Internet,” says Dube. RIM officials will take heart from the upgrade trend in the smartphone market. “We see people starting off at Rs. 1,500 or so and then going up to the Rs. 7000-10,000 range in a year or so,” says Elkana Ezekiel, VP and chief marketing officer, Samsung India. Most of them are young, and within that category, the people upgrading frequently are those finishing school in metros and moving to college. In that group, some upgrade again, to Rs. 15,000-20,000. “This is the main market — the mid-level segment of Rs. 5,000-15,000,” he says. The key will be to launch new models as competitors like Micromax are eyeing the ‘low price’ smartphone territory. Micromax will be adding more features to its phones at the lower end and is also trying to enter the Rs. 20,000 bracket. Equally aggressive is Samsung’s Ranjit Yadav, country head of mobile and IT. The company has around 23 percent market share in the smartphone market at the moment. “The key to success will be to have a range of smartphones at entry, mid and high-end levels,” says Yadav who said that commenting on competition is not their policy. With the newly-launched Curve to the new Bold, RIM now has handsets from Rs. 9,000-Rs. 30,000. According to Peter Misek, analyst at Jefferies & Co., RIM’s success in emerging markets can continue with new models that launched a few weeks ago, along with the BBM and secure internet. That said, the company will face a test next year “The key here, is when will QNX handsets be launched, and how they perform.” All models will move to the new platform, expectedly by mid-2012. If that turns out well, RIM will get a boost across all markets, and especially in emerging ones like India. I am quite familiar with mobile tech and have read many articles on BlackBerry and and most of them have been on how its either doing a lousy job in the US or how its doing good in India. The ones on India were sadly short of detail and poorly done. This one is the first such story that I have enjoyed reading, and would rate as the best. It took me a while to find it in the magazine though, and maybe it could have added a little more background on what happened in the US. Otherwise its a job well done. Please bring us more such stories. I feel manipulated now that I have a blackberry.